Nashville, TN, October 19, 2016…The Don Gibson American Music Foundation is pleased to announce that the first-ever biography of Hall of Fame songwriter and recording artist Don Gibson is being written in cooperation with Gibson’s widow, Bobbi Gibson. Gibson was born April 3, 1928, in Shelby, North Carolina. He entered the country Top 10 for the first time in 1956 with his original composition, “Sweet Dreams,” on MGM Records. After teaming with producer Chet Atkins, Gibson enjoyed 17 Top 10 country hits on RCA Victor, including the eight-week No. 1 single “Oh Lonesome Me,” an early example of the Nashville Sound. Gibson was also one of the most prominent songwriters signed to seminal Nashville music publisher Acuff-Rose. Ray Charles’ version of Gibson’s “I Can’t Stop Loving You” became an international No. 1 pop hit in 1962 and is a cornerstone of Charles’ landmark album, Modern Sounds in Country & Western Music. Patsy Cline’s rendition of “Sweet Dreams” found success at country radio following her tragic death in 1963. Between 1956 and 1980, Gibson charted 82 country singles as a recording artist, including duets with Dottie West and Sue Thompson. Don and Bobbi Gibson were married on June 4, 1967. Don Gibson entered the Nashville Songwriters Hall of Fame in 1973 and the Country Music Hall of Fame in 2001. He died on Nov. 17, 2003. Bobbi Gibson resides in Nashville and has opened her personal archive of photos, press clippings and memorabilia to provide a comprehensive look at Gibson’s accomplishments. Shelburne most recently served as General Manager at MusicRow magazine. In early 2015, he concluded a 13-year stint at CMT, where he served as Senior Editor of CMT.com. In the summer of 2015, Shelburne assisted with the Country Music Hall of Fame and Museum’s award-winning educational program Words & Music, which introduces the art of songwriting to students around the U.S.
A Nebraska native, Shelburne moved to Nashville in 1994 to attend Belmont University. He graduated with a journalism degree in 1997. Visit www.dongibsontheater.com for more information on Don Gibson. NASHVILLE, Tenn. (October 20, 2016) – More performers and presenters have been added to the list of talented songwriters and recording artists scheduled to appear at the 22nd Annual Inspirational Country Music Awards Show®. The two-hour 2016 Inspirational Country Music Awards Show® program is chock-full with extraordinary performances and special appearances. Newly added talent includes: Home Free, Mark209, Dennis Agajanian, Chuck Day, Corey Farlow, Chris Golden, Chuck Hancock, Adrienne Haupt, Johnny Rowlett and Arkin Terrell. Hosted by Megan Alexander and Collin Raye, the awards show will be held at 7PM on Thursday evening, October 27, 2016 at Trinity City (1 Music Village Blvd. Hendersonville, TN). (Pre-show announcements and special performances begin at 6:30PM; attendees are asked to arrive and be seated at that time.) General Admission awards show tickets are FREE to the public. Limited quantities remain available on a first-come-first-served basis. In lieu of tickets, patrons may support of the non-profit organization and its missions with donations HERE. For more information, visit online www.inspirationalcountrymusic.com. The new line-up joins previously announced presenters and performers including: Jeff Bates, Tommy Brandt, Jayne Carter, Cash Creek, Lisa Daggs, Chuck & Selena Day, Mary James, Mikayla Lynn & Isaac Cole, Kali Rose, Shenandoah’s Mike McGuire and Marty Raybon, True Heart, The Wacaster Family and Mark Wills. NASHVILLE – (October 17, 2016) Two-Time CMA and ACM Entertainer of the Year Luke Bryan wrapped his eight annual “Farm Tour” this weekend performing for 105,000 fans in the seven-city run. A total of 50 scholarships have been granted from ticket sale proceeds to a local college student from a farming family within the communities the tour plays. Luke’s first-ever Farm Tour EP, Farm Tour…Here’s To The Farmer is available digitally now. The “Bayer Presents Luke Bryan Farm Tour 2016” was sponsored by Bayer, Chevy, Green Giant, Miller Life, Cabela’s and Polaris. Since the debut of his first album in 2007, Luke has placed 16 singles at No. 1 and sold nearly eight million albums with 30 million digital tracks from his five studio albums. He has twice been named Entertainer of the Year by both the Academy of Country Music and the Country Music Association. His fifth studio album, Kill The Lights, debuted at No. 1 on both the Billboard Top 200 (his third to do so) and Top Country Albums charts and closed 2015 with the best-selling country album of the year and the 10th biggest selling album on the all-genre Billboard Top 200 Year-End list. In Luke’s stellar 2015 year, he performed for 1.5 million fans in concert, had three albums on the Top 15 Year-End Country Albums list- Kill the Lights (#1), Spring Break…Checkin’ Out (#10) and Crash My Party (#15), was the most streamed artist of 2015, placed six songs in the Year-End Top Country Streaming Tracks list, had his own exhibit at The Country Music Hall of Fame and Museum (“Luke Bryan: Dirt Road Diary”), performed live during halftime at the Dallas Cowboys game on Thanksgiving and wrapped up the year with a live Times Square performance on ABC’s “New Year’s Rockin’ Eve.” Luke recently co-hosted the ACM Awards for a fourth consecutive year and is performing in venues and stadiums across the U.S. on his “Kill The Lights Tour” through this fall. Nashville, Tenn. (October 17, 2016) – If you work in the Nashville music business and don’t know the name Charlie Monk, you probably haven’t been around very long. After all, he is the “Mayor of Music Row.” This year, Monk is celebrating six decades of blood, sweat and tears in show business. While attending Troy University, Monk worked a full-time shift on WTBF radio. He later moved to Mobile to join the staff at WKRG radio and television. He was often called upon to work the television side hosting sporting events, parades, and other local happenings. While studying at the University of Alabama, Monk had a stint as program director and afternoon personality at WACT in Tuscaloosa before returning to Mobile as PD at WUNI. That country station captured the Number One position in their market under Monk’s tutelage. In 1968, Monk made his move to Tennessee and WMTS radio to be close to the music business. His free-form music and talk show for the station was the first daily broadcast from Music Row. He joined the staff of ASCAP in 1970, where he first became an influential player on Music Row. In 1977, he became Nashville chief of CBS Songs and in less than four years, the company became one of Music City’s top three publishers. He stayed until forming his own music publishing company, Monk Family Music Group, in 1983. Monk took a leave of absence from his own company in 1988 to spearhead the return of Acuff-Rose to its former glory. During Monk’s tenure, Acuff-Rose was the first publisher to win both ASCAP and BMI “Most Performed Song of the Year” in the same year. After returning to helm the Monk Family Music Group, he was named SESAC‘s Publisher of the Year in 1998. Nashville, TN – RCA Nashville GRAMMY Award-winner, Miranda Lambert, shares the song titles of the 24 tracks as well as which disc they appear on; Disc 1 THE NERVE or Disc 2 THE HEART. The Weight Of These Wings, which releases November 18. The Weight Of These Wings is available for pre-order starting this Friday, October 21, and as previously announced will be a double album. Frank Liddell, Glenn Worf, and Eric Masse share the producing duties on The Weight Of These Wings. 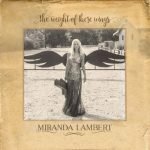 The Texas native is set to release her sixth album, The Weight Of These Wings, on November 18, 2016. The first song released from The Weight Of These Wings, “Vice,” hit the Country Radio airwaves on July 18th touting a tally of 109 first week monitored reporting stations spinning the new song. 2014 CMA Nominees! The full list! STRAIGHT NO CHASER RAISE A GLASS TO THE UPCOMING HOLIDAY SEASON WITH "I’LL HAVE ANOTHER…CHRISTMAS ALBUM"
On the heels of the announcement about her highly anticipated double album The Weight Of These Wings in stores on November 18, Lambert is plan ning a trek to perform these new songs for her fans on the upcoming Highway Vagabond Tour. Her first single “Vice” is swiftly climbing the charts at radio and has her fans and critics swooning alike. “Lambert is one of the best songwriters in the game, and “Vice’s” gloomy heartbreak is masterfully done”, as reported by USA Today. “It marks a shift in her sound, the tune is laid bare against understated atmospherics and a howling electric guitar. … It’s a gorgeous reminder that while Lambert may be sitting on country music’s throne, her feet remain on the ground” adds Entertainment Weekly. Known for her energetic, fun as well as emotional live performances, Miranda is ready to kick it up a notch in 2017 with new stories and new music. Joining her on the Highway Vagabond Tour are special guest Old Dominion and Aubrie Sellers. About Old Dominion: Proving that they are not your average country band, Old Dominion lend old-fashioned country charm, lyrical wit and rock n’ roll grit into radio-friendly hook-heavy pop nuggets. Old Dominion have emerged as one of the hottest breaking bands in country music, fusing clever lyrics and an infectious sound. The band released their first full-length album Meat and Candy, which Entertainment Weekly called a “deceptively smart, occasionally cheeky, stellar debut.” Old Dominion released their PLATINUM two-week No.1“Break Up With Him” and RIAA certified GOLD hit “Snapback” prior to their third single “Song For Another Time,” which is Top 15 and climbing. They spent their summer on Kenny Chesney’s Spread The Love Tour and are now headlining their Meat and Candy Fall Tour, with 15 of the dates tapped as Stagecoach Spotlight: Old Dominion Meat and Candy Tour; the first-ever tour produced by the award-winning Stagecoach Music Festival. The ACM and ACCA Breakthrough Duo/Group of the Year are also nominated for two CMA Awards: Best New Artist and Vocal Group of the Year and Favorite Duo or Group – Country for the 2016 American Music Awards. Old Dominion consists of lead singer Matthew Ramsey, lead guitarist Brad Tursi, multi-instrumentalist Trevor Rosen, bassist Geoff Sprung and drummer Whit Sellers. Luke Bryan Awards 50 College Scholarships With Ticket Proceeds from "Farm Tour"
Two-time reigning CMA Entertainer of the Year Luke Bryan will wrap his “Bayer Presents Luke Bryan Farm Tour 2016” this Saturday and a portion of the proceeds from the eight year run will bring his total of awarded college scholarships to 50. The “Luke Bryan Farm Tour Scholarship” is granted to a local college student from a farming family within the communities the tour has played. The tour resumed in Batesville, Mississippi last night, the first concert back since his collar bone surgery over the weekend to repair a break from a mountain bike accident. The ever-positive Luke upheld ‘the show must go on’ attitude not missing a beat and continued with the remaining three shows scheduled last week. Fans unable to attend a farm tour show were able to tune-in for a livestream on Luke’s Facebook page last Friday from Greenback, Tennessee. Sounds Like Nashville was along for that show too. Watch their story here- https://youtu.be/0qX02ox5SYg . Luke’s arena and stadium tour, “Kill The Lights Tour,” will come to a close this month with two remaining stadium shows, the AT&T Stadium in Dallas on October 22 and October 29 at Ford Field in Detroit. The “Bayer Presents Luke Bryan Farm Tour 2016” is sponsored by Bayer, Chevy, Green Giant, Miller Lite, Cabela’s and Polaris. Few brand s enjoy a heritage as rich as that of Green Giant®. For over 100 years, Green Giant has been devoted to growing the best quality and most unforgettably delicious vegetables for you and your family. For more information and some simple and tasty recipes, please visit www.greengiant.com. Through its diverse collection of storied breweries, MillerCoors brings American beer drinkers an unmatched selection of the highest quality beers steeped in centuries of brewing heritage. Miller Brewing Company and Coors Brewing Company offer domestic favorites such as Coors Light, Miller Lite, Miller High Life and Coors Banquet. Tenth and Blake Beer Company, our craft and import division, offers beers such as Leinenkugel’s Summer Shandy from sixth-generation Jacob Leinenkugel Brewing Company and Blue Moon Belgian White from modern craft pioneer Blue Moon Brewing Company, which celebrates its 20th Anniversary this year. Tenth and Blake also operates Crispin Cider Company, an artisanal maker of pear and apple ciders using fresh-pressed American juice, and imports world-renowned b eers such as Italy’s Peroni Nastro Azzurro, the Czech Republic’s Pilsner Urquell and the Netherlands’ Grolsch. MillerCoors also offers pioneering new brands such as the Redd’s Apple and Redd’s Wicked Apple franchises and Smith & Forge Hard Cider. MillerCoors seeks to become America’s best beer company through an uncompromising promise of quality, a keen focus on innovation and a deep commitment to sustainability. MillerCoors is a joint venture of SABMiller plc and Molson Coors Brewing Company. Learn more at MillerCoors.com, at facebook.com/MillerCoors or on Twitter through @MillerCoors. Cabela’s I ncorporated, the World’s Foremost Outfitter® of hunting, fishing and outdoor gear, offers thousands of products and a fun, unique shopping experience. The company is famous for its strong brand and world-renowned reputation for delivering quality merchandise, value and legendary customer service. Cabela’s also issues the Cabela’s CLUB® Visa credit card, which serves as its primary customer loyalty rewards program. 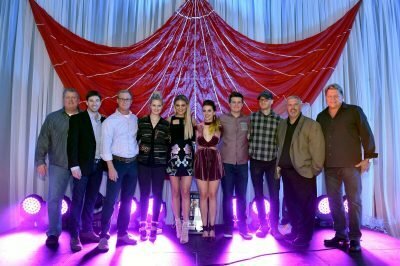 Celebrating her high flying, third consecutive #1 single surrounded by planes and parachutes, Kelsea Ballerini and her music industry supporters toasted to the success of “Peter Pan” at a massive party held yesterday (10/12) in a Nashville airplane hangar. Standing alongside the song’s co-writers Forest Glen Whitehead and Jesse Lee, Ballerini told the assembled crowd it takes the hard work of many different people to climb so high. “This is bigger than me,” she said, before concluding with a promise to keep aiming for the stars and to make her believers proud. Decorating the cavernous space to mimic the feel of the “Peter Pan,” music video (directed by Kristin Barlowe), directed by Kristin Barlowe Ballerini, her co-writers and co-producer Jason Massey were presented with #1 plaques and gifts from ASCAP, BMI, and publishers ole and Black River Publishing, before Ballerini’s record label – Black River Entertainment – surprised the star with news that her debut album had just reached GOLD certification for sales of over 500,000 copies. Performing alongside her co-writers, the 23-year-old then delivered laid back acoustic renditions of “Peter Pan” and “Yeah Boy,” the fun-and-flirty fourth single from THE FIRST TIME, before joining in the celebration. Capping off an outstanding year, the Black River recording artist will receive CMT’s second-annual Breakout Artist of the Year award during the network’s 2016 Artists of the Year special, premiering October 20 at 9 p.m. ET, and November 2 will find her at the 50th annual CMA Awards where she is nominated in two categories: New Artist of the Year and Female Vocalist of the Year. She is also vying for Favorite Female Artist – Country at the fan-voted American Music Awards on November 20, airing live at 8 p.m. ET on ABC. Voting is now open through Nove mber 14 at amavote.com. Ballerini holds the distinction of having written all three GOLD-certified singles from her debut album THE FIRST TIME, including her PLATINUM-certified debut, “Love Me Like You Mean It.” Produced by Forest Glen Whitehead and Jason Massey, THE FIRST TIME showcases Ballerini’s skillful songwriting on each of the 12 songs. After spending the summer winning over audiences on Rascal Flatts’ RHYTHM & ROOTS Tour, Ballerini is set to headline her own tour, aptly titled, THE FIRST TIME Tour. Kicking off this fall, she is already proving her crowd-drawing potential with two shows confirmed as early sell-outs, including her hometown concert in Knoxville (11/ 11) and Minneapolis show (11/19). Kelsea Ballerini has launched to stardom with releasing three consecutive #1 smashes from her critically acclaimed debut album THE FIRST TIME; the PLATINUM-certified “Love Me Like You Mean It” and GOLD-certified hits “Dibs” and “Peter Pan,” making her the only female artist in Country music history, including female duos and groups, to achieve this accolade. The talented singer/songwriter’s credit is featured on all 12 songs on her debut. Abuzz with high-profile media looks, the Black River Entertainment artist has been named “The Country Sweetheart” in People Magazine’s elite “Ones to Watch” portfolio, touted by Billboard Magazine as “Country� ��s Next Queen,” praised by Rolling Stone as the “Nashville It Girl,” selected as one of CMT’s Next Women of Country, and this summer co-hosted alongside Arsenio Hall on ABC’s summer replacement series Greatest Hits. Awarded Billboard’s “Rising Star” honor at the prestigious 2015 Women In Music event, Ballerini continues to gain recognition with scoring her first-ever ACM Award win for New Female Vocalist of the Year, the fan-voted Radio Disney Music Award for The Freshest – Best New Artist (all genre) and the American Country Countdown Award (ACCA) for Breakthrough Female of the Year. She will embark on her first solo headlining tour – THE FIRST TIME Tour – this fall. To wrap up the month-long celebration of Hispanic Heritage Month (Sept. 15 – Oct. 15), Rolling Stone Country today premiered country Latin artist Stephanie Urbina Jones’ video, “Vamonos! (Let’s Go).” See the video here. A song like “Vamonos! (Let’s Go)” requires a buoyant video, so director Miguel Valle (Coldplay) and producer Jerry Carlon headed to the island of Isla Mujeres in Mexico for the video shoot. Jones was totally up for it. “Two days, six crew members, two best friends, a drone, two golf carts, crashing a wedding and a crazy beautiful island in the Mexican Caribbean; we captured the heart and spirit of what I love abo ut Mexico, the Mexican people, and the song ‘Vamonos’,” she enthuses. It is well documented that songwriters find inspiration for their craft from any variety of places. While “Vamonos! (Let’s Go)” is an upbeat, breezy song with a sunny island video, it was actually written during a very difficult time in Jones’ life. With the help of co-writers Mark Marchetti and Will Robinson, she was able to draw from her heartache and write the song that breathed new hope into her life. Now, through “Vamonos! (Let’s Go)” and the rest of her music, Jo nes is on a mission to share her new hope with as many people as possible, as she believes that music is a medicine that brings joy, laughter and fun into the world during turbulent times. “Vamonos! (Let’s go)” is the second single and video from Stephanie Urbina Jones’s fifth album, Fiery Angel. The song embodies her unique brand of Latin country, which celebrates the heart and spirit of her Latin roots in country music. Fiery Angel was just one of two releases for Jones in 2015. The other was a spunky collection of holiday cheer titled Feliz Navidad Y’all. For more information or booking, visit www.stephanieurbinajones.com. The San Antonio native and #1 Billboard Country Latina songwriter is passionate about celebrating her Hispanic heritage in country music around the world. Jones has been winning international acclaim while shattering traditional music industry boundaries and genres with shows across the US, Mexico, Japan, Europe and the UK. With Fiery Angel, she arrives as a woman who inspires, a songwriter who bravely explores the heart’s darkest corners and a singer who interprets life with passion and intimacy while carrying the heart of her bicultural roots to audiences all over the world. Eric Paslay Releases Acoustic With Strings Version of "Angels In This Town"